One spring towards the end of my teaching career, I had a parent request a meeting. All educators know that when parents request a meeting, it usually means that they want to complain about something that you did. I didn’t know what this parent wanted to complain about, but I braced for it. She handed me a blank piece of paper and asked me to write a letter to her daughter. She explained that she had started doing this for her daughter in kindergarten. Every year she had the teacher write a letter to the daughter as an eighteen-year-old. She was compiling the letters in a binder, and as a graduation present, she would give her the binder with letters from her thirteen years of school. Anybody who knows me can guess that I shed a tear, both at the thoughtfulness of this mom and at the honor to be able to write a letter like that to a student. I decided then and there that when I had kids I would do the same thing. write on a page each year until they graduate, and then give them the book for high school graduation (if you ever talk to my kids, you are sworn to secrecy. In fact, I will probably be taking this post down in a couple of years when my kids start surfing the web, because I want to keep this under wraps. If you sign up above to follow by e-mail, you will get posts sent directly to your inbox in case I ever do take posts down due to familial security concerns). So every year I meet with the kids’ teachers. I give them the book and let them take it for as much time as they need to write in it. And every year, when I get the book back, I read what the teacher has written and I shed a tear or two. I think of the future, and what it will be like to see the look on my kids’ faces when they read what their teachers have written. I think of the wonderful impact that each teacher has had up to this point, and of the wonderful teachers that I know my kids will have in the future. And of course I think of the privilege that I have as an educator, helping to guide young people on a daily basis. For the teachers who read this, while not every parent does a gift like this, you could proactively give your students a gift like this. It is not feasible to buy a book for every one of your students, but writing a letter to the student, sealed in an envelope, with a “Do not open until…” written on the outside of the envelope would be really cool. 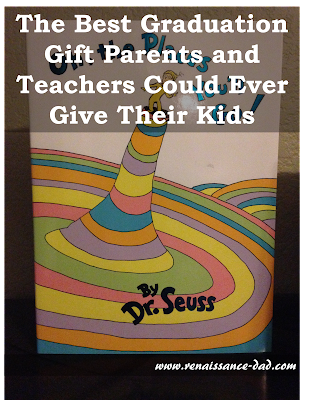 This could be given to the parent with instructions to hold until the child graduates, and it would be a gift that would be cherished by student and parent alike. So for all of the teachers who have signed my kids’ books, for those who will in the future, and for those who will never teach my kids but give it their all every day, I thank you for all that you do to mold and shape our future.